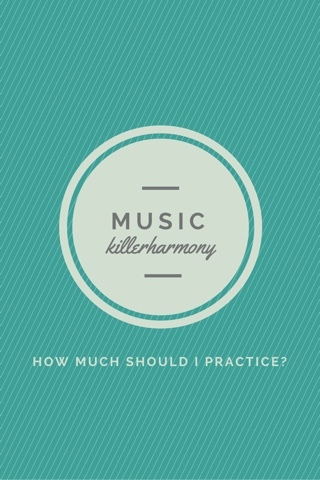 How Much Should I Practice Music? There is the age old question that a lot of music students face: how much should I practice my instrument each day? I have been struggling with finding the answer to this question myself, and I am going to try and break it down by section and give you a general guide for how much you should practice. As a disclaimer, your needs might vary from what I say here. The amounts of time I list will (obviously) be different for different types of instruments, and if you practice more, that’s great. If you feel like you can make steady progress by practicing less than what I say, that’s great, too. These are purely generalizations to help figure out what works for you as an individual. Also, this post will be more focused on practicing music because it is what you want to do with your life, and it will be more catered to people who play woodwinds, since that is what I know the most about. If you are interested in what you should do for your specific instrument, I suggest doing a deeper search to find what you are looking for. If you are just playing music for fun, you don’t have to practice as much since it is not going to be your career. I think before you take my advice or the advice of anyone on the internet, you should consult with an expert on your instrument, preferably your private teacher or maybe someone who plays your instrument and is doing with it what you want to do someday. Now for the actual practice amounts. I once heard that you must practice two hours a day to maintain your level of skills and more than that if you wish to improve. I think that is a good goal, but the specific amount that you practice should be dictated by how much music you have to work on and how fast you need to master those pieces. If you get new music two weeks before a performance, you should probably dedicate more time to making them the best they can be. If you have the music for two months, then you should work on it, but you don’t have to be so involved in mastering them as quickly, unless you are required to for some other reason. If you are working on piccolo, which you should if you want a career playing flute, you should also factor in time for that in addition to your time spent on flute. If you are playing clarinet or saxophone, you need to practice quite a bit, especially if you are working on the auxiliaries, too. Each instrument takes time, and like I said with flute, you need to spend the time to play your music and sound your very best. You might not be able to practice as much at a time as a flute player, though, because your embouchure might need more of a break than 30 seconds from the reed/mouthpiece combination. If you play oboe or bassoon, odds are you can only play for a certain amount of time before your lips give out. This amount of time will increase with your time playing the instrument and skill on it. You may not be able to play for hours at a time, but that’s okay. You gotta find some way to get your reed making in! I think that brass instruments are similar to double reeds in that you need to give your chops a break every so often. If you can go for hours and hours of practicing, that’s awesome, but you don’t want to over work your lips to the point of where you cannot play for a show. I don’t know much about percussion, so I won’t say much, but you should probably dedicate enough time to all of the various percussion instruments: mallets, drums, etc. Each one needs focused practice, so you might need to spend multiple hours a day playing your instruments. I grouped these two together, because they can both be played for many hours at a time. You don’t have to worry about your lips giving out, but you should still take frequent breaks to avoid cramping up and developing a musician’s injury. I am not a singer, but I know that if am singing along to songs on the radio for a long time, my voice will start to give out. It will start to squeak, and my throat feels closed up. Consult a voice teacher and find what works for you in terms of how long you should practice. So that was my thoughts on how much you should practice. I avoided giving numbers, because I am not an expert on all of these instruments. You need to experiment with different lengths of practice sessions and find what works for you. Don’t practice too much-because it is possible-and don’t forget the importance of practicing enough. How much do you practice? Have you ever felt like you were not practicing enough or were practicing too much? Let me know in the comments! Thanks for reading and be sure to check out my new Etsy shop!